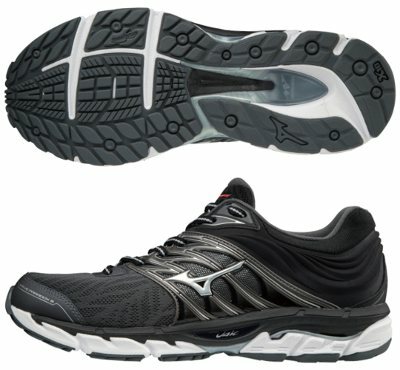 Mizuno Wave Paradox 5 are stability cushioned running shoes. A few cosmetic changes in current Mizuno Wave Paradox 5 are enough for the japanese brand to release a new edition and update (aka rise) retail price. It seems there is not much marketing budget for pronation control lineup and it is difficult to set strict border between top Wave Paradox 5, more versatile Wave Horizon 2 and "lighter" Wave Inspire 14. Anyway Wave Paradox 5 offers what everyone would expect: abundant cushioning, great stability and high quality materials at premium price. All changes from its predecessor Wave Paradox 4 take place in upper which has been completely refurbished. Reinforcements focus in midfoot with a modern and attractive design to wrap foot for a secure and snug fit. Toe cap layer has been decoupled so link with the rest of the structure has been removed to free this problematic location. Clearer forefoot area definitely enhances ventilation and increases comfort with improved breathability. Another minor update is the more cushioned (and removable) insole. There is no change in impressive midsole which besides abundant cushioning features great stability and structural stiffness hard to find in other running shoes. It keeps the same configuration used in its counterpart for neutral runners Wave Sky 2 with Wave™ plate between full-length U4ic™ foam on top and two pieces of U4icX™ below. In this case there is an specific double Wave™ plate from heel to midfoot to support pronation and from midfoot to forefoot there is a normal one to increase stability. Outsole features minor changes regarding lug configuration around midfoot while keeping major flex grooves in forefoot for smooth transition. No change in materials either with robust and reliable X10 used in more exposed areas to increase durability.